In this stage you will model the addition of a field to an existing data structure (and the corresponding database table). The new field will have a predefined set of possible values, which the user can choose from a drop-down list. This stage’s modeling should be performed in the Tutorial 4-5 project, you imported at the end of the previous stage. We want to enable the employee to distinguish urgent requisitions from regular one. To do so, let’s add an Urgency field to the requisition, which can have two possible values – Regular and Urgent. This is implemented using a Chooser display element which allows users to select from a list of predefined values. Note that the Description text area and label have been moved into a Row display element named Description Row. This causes the popup to look neater, by ensuring the elements inside the row will always appear together in the same row. Zoom into the Enter New Requisition popup. 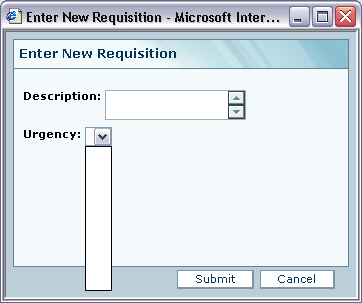 Select the Display/Row template ( ), and drag it into Enter New Requisition, below Description Row. Zoom into the Urgency Row. Select the Display/Label template ( ), and drag it into Urgency Row. Name it Urgency:. Select the Display/Chooser template ( ), and drag it into Urgency Row. Name it Urgency. Select the Basic/Action template ( ), and drag it into Enter New Requisition; Name it Initialize Urgency Chooser. Zoom into Initialize Urgency Chooser. Right-click on the Initialize Urgency Chooser process, select Add Ancestor Reference from the menu, and select Enter New Requisition. Since there are only 2, pre-defined urgency values we wish to use, we can define those using Constants (which are data elements with a predefined fixed value). Select the Constants/Text template ( ), and drag it into Initialize Urgency Chooser; Name it Regular. Notice that the Regular data element we have just added is displayed as “Regular” instead of Regular. This indicates it is a Constant. “Regular” is a textual constant (a string of characters). There are also numeric constants, date constants, etc. Values for a chooser need not necessarily be defined using constants. The values may also come from any other data source, such as the result of a previous process, a database table or a spreadsheet. 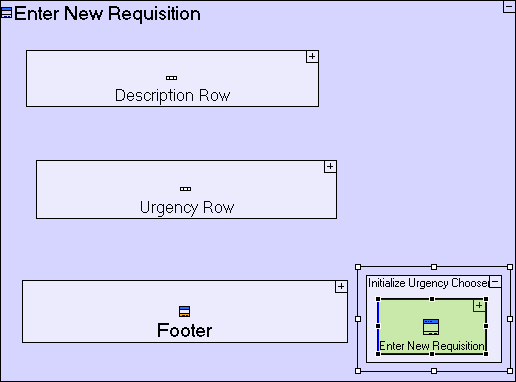 Create a flow from the “Regular” constant to Enter New Requisition/Urgency Row/Urgency/<Options>. Select the Constants/Text template ( ), and drag it into Initialize Urgency Chooser; Name it Urgent. 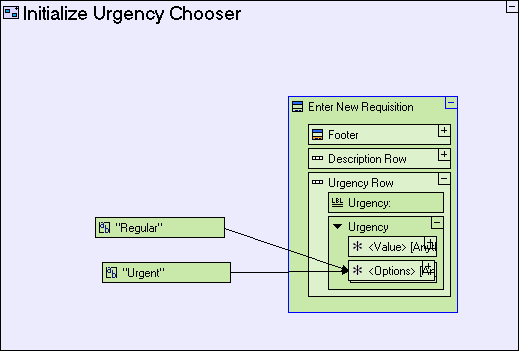 Create a flow from the “Urgent” constant to Enter New Requisition/Urgency Row/Urgency/<Options>. The Urgency chooser now appears in the display, but the entered value is not saved with the requisition. We should also model the addition of the Urgency field to the Requisition database record. Zoom to the Requisition database record in Footer/Submit. Select the Data Types/Text template ( ) and drop it into Requisition. Name it Urgency. 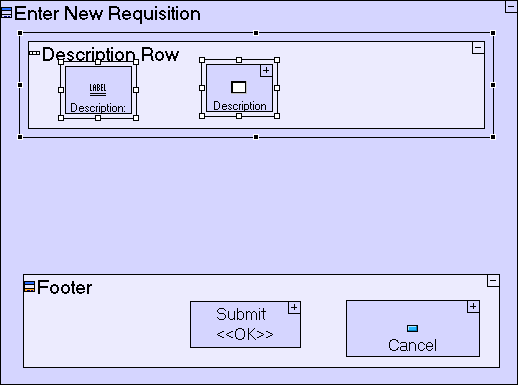 Note that as the Requisition database record is reused in 2 models (Submit and Requisition List), you can actually perform the above steps in Requisition List/Requisition, with the same effect. In any case, the change will affect both. Zoom to the Submit button in Footer. 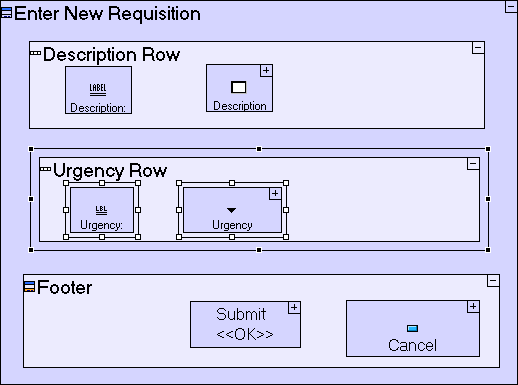 Create a flow from Enter New Requisition/Urgency Row/Urgency/<Value> to Requisition/Urgency. The Chooser has 2 predefined data elements, <Options> and <Value>. <Options> contains the values appearing in the chooser (which is why it is a repetitive element). <Value> contains the currently selected value. 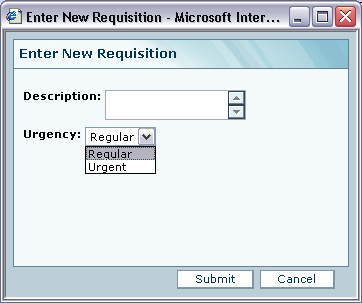 Without doing any additional modeling on the Requisition List table model, it now displays an Urgency column. This is because the Requisition database record is reused in the Requisition List model. And since the Requisition database record defines the actual structure of the database table, the structure of the Requisitions table in the database is also updated with a new field, Urgency. Records that existed in the database before the addition of the Urgency field will have a NULL value, and will be displayed as an empty value as can be seen in the screen shot above. Import the sample project Tutorial 5-6 and use it as the basis for the next stage of the tutorial. You may now proceed to Stage 6, in which we shall model the next stage in a requisition's lifecycle, the approval of the requisition by the employee’s manager.